Panzerkampfwagen loosely translates into English as 'armored combat vehicle', and just as we use the short word tank to describe one, the Germans use Panzer. The German tanks from the Panzer I through the Tiger look like they belong to the same family. If asked, most Allied soldiers would say that they fought against Tigers each day of their campaign. In truth, the Tiger was actually a rarity in most combat situations. There were just too few of them. The actual tank that the allied soldiers were up against was more than likely the Panzer IV. The Panzer IV was actually the backbone of the German tank units. Amazingly, the Panzer IV was actually designed in 1936. The Panzer IV was used operationally from 1938-1945. Seven years does not seem too long, but all you have to do is compare the world's standard tanks or tankettes in 1938 to the behemoths of 1944 and 1945. The engineering of the Panzer IV was such that it was able to be upgraded and used on the front line all the way through the war. 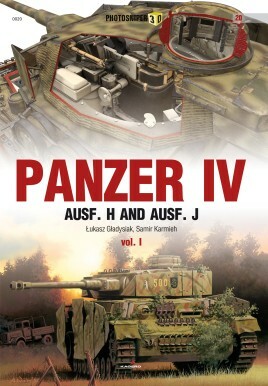 This book is actually Volume I on the most numerous built versions of the Panzer IV: AUSF. H and AUSF. J, the J version being the last one to be produced. The Panzer IV was also imported into Syria from left over WWII stock, and used as late as The Six Day War. Chapter one goes through the development history of all of the different versions. Chapter two gives a run down of all of the tanks' technical aspects. There are sections on armor, armament, and the electrical system, etc. There is even a section on the wireless equipment. The next section of the book is a photographic walk around of an intact Panzer IV in Belgium. These close-up photos are a modeler's dream. The next part of the book is where I get to say "It is good to be alive now". This section is a stunning 3D visual walk in and around a Panzer IV. It is an amazing fifty-two pages of a computer generated wonder that even shows the inner workings of the Panzer IV. Short of getting to spend a few hours in and on a reconstructed Panzer IV, this is as good as it gets. I cannot wait to see more of this series from Kagero.